All this while, the only thing that has bothered the LGBT community is the lack of equality in acceptance from the world. And if, you end up referring to them or treating them as some different couple, what is the whole point of the fight they put up? Understand that love has no barriers and it is absolutely normal as it is with the straight couples. Moreover, there’s more to their identity than their orientation. Imagine someone generalizing you as one of those guys or girls, and then step into their shoes to realize what they’ve been putting up with daily. Being gay or lesbian is not their only identity, they must be unique in their own way and everyone deserves to be known beyond their gender or sexual identity. The sooner we learn, the better it is. Never ever ask “So who’s the guy here?” or “You’d look great as a bride!”. Please don’t! Understand that not every guy in the relationship wants to be referred to the “groom” and vice versa. Refer them as individuals, instead of using “wife” or “husband”, use words like “your partner” or even call them by their names, but don’t specify gender-based declarations. Especially if they are getting married, it is very important to note that most of them do not identify themselves on either side of the gender bias. They might just be individuals following the positive approach as mentioned by Peter Shepherd in his personal development course. So kindly respect the choice to not be gender specific, whatsoever be the reason. Even though the world is changing and people have started to accept and acknowledge the LGBT community, you are nobody to declare somebody else’s news! Always remember that! Trying to help the couple you’re friends with, is totally different than taking the center stage and spilling out the beans. Respect their need for privacy and the concerns, understand their choice when they do not share it with everyone, or every time. On a general basis, it is always advisable to only talk once the topic is brought to everyone’s notice by them, itself. Like I already mentioned, never ever treat them any different than your existing friends, which also includes no special treatment. If there’s anything that does not seem right on any individual’s part, call them out as you’d stand against anybody else. Do not be afraid that you’ll hurt their emotions for equality also stands for equal treatment. Just because they have been through a lot of difficult times, it doesn’t give them a free pass for any bad behavior. Recognize them as you’d recognize any other friend of yours. The truth, however, is that the LGBT community has been tortured in various unacceptable ways and is still struggling to gain full-fledged support everywhere. Just an “I’m proud of you” or “I respect your choice” can do wonders when all they’ve been listening to, is constant criticism. Your love and support is a gift that they’d nourish more than any other present in the entire world. It is always good to know that someone’s got your back! Be that someone for them and let them know that you’re proud of them always. Not only these but learn and understand what goes through the minds of such couples and try to make them as comfortable as possible. If the human heart were visible, it would be a ball of light floating in space! So don’t forget to be loving, caring, respectful and adaptive like any other friend would have been. Make them count on you, and count on them too for friendship is never one-sided! 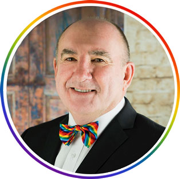 Author Bio - Bronte Price is Australia’s First Certified Gay Wedding Celebrant. He stands strongly for marriage equality and takes immense pleasure in marrying any couples in love. He has also co-founded The Equality Network to help wedding suppliers create a better wedding experience for LGBTI couples. He is a regular volunteer newsreader at Joy 94.9, and a member of GLOBE (Gay and Lesbian Organization for Business and Enterprise). Beyond this you will find him either in his organic backyard vegetable garden or taking walks with his fiancée Clint and their four legged fur baby – Bingo.